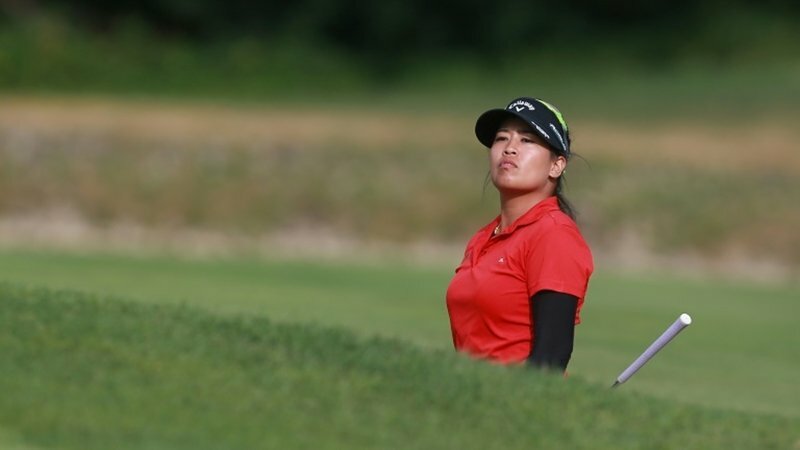 GOLF: Thailand’s Thidapa Suwannapura crowned a roller coaster round with a final-hole birdie to take a one-shot lead after the opening round of the LPGA Tour’s Marathon Classic in Ohio yesterday (July 12). The 25-year-old from Bangkok, who is chasing her first victory on the tour, carded 10 birdies and four bogeys to finish the day with a six-under par 65 at Highland Meadows Golf Club in Sylvania. Thidapa’s blistering round included seven birdies on the back nine, the last falling on the 18th to take her one stroke clear at the top of a congested leaderboard. A cluster of seven players were lurking menacingly on the world number 163’s shoulder on five under. The chasing pack included South Korean stars Chun In-gee, Lee Mi-rim and defending champion Kim In-kyung, who all posted 66s. Kim was unable to build on a dazzling performance over the front nine, which left her at five-under at the turn, with a bogey and a birdie on the back nine cancelling each other out. Chun surged up the leaderboard after rattling in four consecutive birdies on her closing four holes. Also one off the lead were Sweden’s Caroline Hedwall, Taiwan’s Tseng Ya-ni and American duo Jacqui Concolino and Katelyn Dambaugh. Eight players were two off the lead on four-under, including Canada’s Brooke Henderson, who made five birdies and one bogey in her 67.